I think Ping is pretty neat. 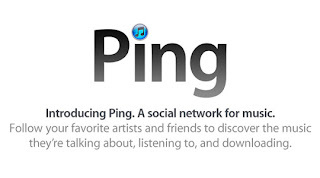 It's not as good as Last.FM or other things yet, but the key advantage Ping has is that it will have massive distribution through iTunes and it's closer to the transaction (i.e. real music tastes) than other services. I'm expecting it to be really awesome in a year or so after a couple releases. 1) Need people's last names or at least last initial. for example "Scott O." is way better than "Scott". I'm already getting confused on who is reccomending what and I bet only 10% of my friends are even on it. 2) Swap Ping into the real estate that Genius takes up on the right part of my itunes screen. Way better and I bet it eventually leads to a higher conversion of sales too. I'm much more likely to buy what my friends like than pre-selected choices. 3) Maybe this is controversial, but I'd love to see anytime my friend rates a song at a 5-star level. I don't need a full album review. I want to see the songs that my friends really like. This may muck of the stream a little, but it's worth a shot. 4) iTunes needs to create a landing page for every song. Amazon already does this pretty well. I've already noticed that I want to write reviews for songs way more than albums. A landing page for each song makes firing off a review very easy and there is no conflict in the reviewers mind about whether the album deserves a different rating than the song. More Reviews = More $ for Apple & Better Music for Listeners.